Anyone can host an event or help raise awareness for WEAAD. In particular, we encourage councils and seniors groups to jump on board and get together on the day. It can be as simple as an afternoon tea or walking through your community wearing purple (although you’ll need to rug up because it is June!). Get started with our WEAAD Toolkit. Use our sample media release to promote it. The list below has some ideas for events and activities. For tips on making them a success see here. Definitely the easiest way to get involved! The news section of this website will provide a space for conversations and artistic interpretations around the topic of “Human rights are ageless”. We want to create multi-generational exploration of ageing in Australia, including how our attitudes towards ageing challenge, infringe on and/or support the rights of older people. Anyone can contribute. Maybe the simplest thing we can all do is wear purple – a splash of colour or a whole outfit. You could also decorate in purple whatever people will see (such as a window, door or tree) and provide some WEAAD information. Depending on how daring you are, going purple for WEAAD can be as simple as asking people to wear a touch of purple to work, providing them with some WEAAD information, and maybe even collecting money from them for an organisation working to stop elder abuse. You could raise money to help people experiencing elder abuse to receive the support they need by having a “purple or pay” day at your office. People can wear purple – or they can pay to not wear purple! For an more charitable twist, you can put a low cost ($1) on wearing purple and a high cost ($5) on not wearing purple. Offer a prize for the most purple person in your office. These can be set up with purple balloons and information from Seniors Rights Victoria about WEAAD. You may need permission or a permit for some places. Local councils or other organisations could organise and promote an “Awareness Walk” and invite community members to participate. This can be particularly effective if you choose a very public route and all wear purple! Hold a morning or afternoon tea. You could invite a guest speaker to introduce topics around elder abuse or simply use it as an opportunity for guests to have an open conversation with each other. Guests could wear purple and eat purple food. Write to your local paper reminding people that our older citizens have given to us for many years and it is now our turn to give back to them. Talk about how ageism and lack of respect for our older people makes them more vulnerable to abuse. Call for the community to be proactive in engaging older people. Host a lecture, debate, speech or presentation on ways to prevent abuse and neglect in later life - speakers are available via Seniors Rights Victoria or invite professionals from your local area who work with older people so the audience can learn how to recognise and respond to elder abuse. Use social networking to raise the awareness about abuse of older people. Post positive messages about ageing. 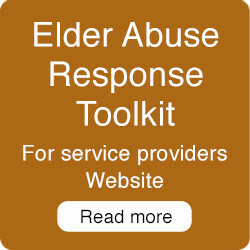 Lots of good information available on elder abuse websites. Invite community members or schools to participate in making posters and displaying these in libraries, local councils or shopping centres. It’s great to get schools involved – students can practice their graphic design or photography skills while creating an eye-catching display to help raise awareness in the general community. They also learn about elder abuse in the process and reflect on their own relationships with older people. Displayed in the local community centre, library or health centre, the information can be accessed by at-risk people too and help them to understand the assistance available. Have the Mayor or local MP plant a tree to mark the day. A declaration could be made by the Mayor or MP to commit to reduce elder abuse in the community through raising awareness and choosing policies that make your community a positive place to grow older. Invite the community to watch the tree planting – or have everyone plant a tree in commemoration of the older people who influenced their lives. Tie big purple ribbons round the trees. Depending on how your building’s exterior lights work, getting your building lit up in purple could be the easiest thing you can do for WEAAD. The result is striking and is bound to get people talking. Post information on your website, social media and newsletter about the reasons for lighting the building purple so you raise people’s awareness as well as catching their attention. You can buy and wear a WEAAD purple ribbon. You could also buy a length of purple fabric (you probably want it at least half a meter wide) and tie it in a bow around a tree, a lamp post, a pillar or column on your building or a door handle. In fact, why not get your whole business community behind you with purple ribbons along every street? We’ll be adding to this page as people send us ideas or questions so feel free to contact us if you think we should add something. 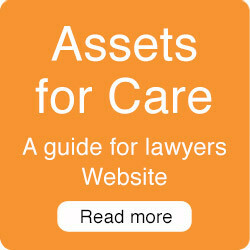 For resources from other Australian organisations see here and here.